I can freely admit that I read this book not once, but twice, in my pursuit to give it a thorough review. 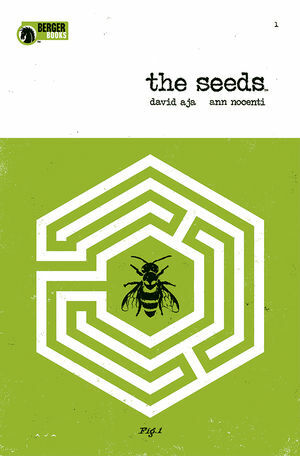 THE SEEDS is almost a perfect example of too much narrative on top of the intriguing art. It isn’t until you get to the point where Astra is getting her work assignment about halfway through the book that it starts to get on track. The first pages seem to be for staging or ambiance only. The future is grim. Got it. There is a wall. Got it. It only needed a page or so to get this done. As stated before, the glimmer of hope is seen as Astra is working her journalistic chops. He’s tasked with getting a fake story about a local club. When she thinks this is a shallow pursuit, she trips on a meeting in a back alley. With an alien. Duh dun. The story has the potential to be a few Children of Men meets X-Files. But it has a ways to go. With a story arc that is executed over a total of four books, it will need to really get going. Less atmosphere, more plot. The art by David Aja is cool. It’s an Andy Warhol-esqe style with two colors – black and green. Each frame looks like a picture was taken and it was drained of all its colors. It is quite suitable for the story and the lack of color or detail don’t divert from the narrative. With an interesting concept, I would say it’s not a lot of books to get involved with to see where this goes. However, to get this train on track – I believe there will be less chugging and more runaway required over the next few books to keep interest high.